CasterHQ Stainless Steel caster wheels are made to withstand harsh environments and applications that would normally rust and corrode standard zinc plated casters; all metal parts are made entirely out of high quality 304 STAINLESS STEEL, offering exceptional quality, functionality, value and availability! To offer fast deliveries and competitive prices, we mass produce and stock all the parts; required to quickly assemble these high quality steel caster wheels to your desired specifications. 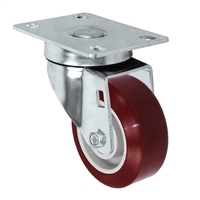 These series are designed, formed and welded for optimal strength and mobility, to withstand the rigors and abuses typical for medium heavy duty caster applications. Popular applications include; clean rooms, laboratories, medical & hospital facilities, animal cages, pharmaceutical plants, autoclaves, food processing, bakeries, dairy, food service, catering, hospitality, chemical factories, marine environments, fisheries, cruise ships, etc. •	All metal parts made from 304 STAINLESS STEEL. 100% washable. •	NSF Listed / Certified. •	Standard stock series = Quick deliveries.